Scarlett was born in Huddersfield Royal Infirmary on 7.9.2006. She was 7 weeks early and Weighed 4lb 40z. Initially everything seemed fine. The doctor who had checked her over shortly after the delivery said that she was in good health although her legs seemed to be a little short.After being allowed a brief cuddle she was then sent to the intensive care unit. Unbeknown to my partner Steve and I this was the correct procedure for premature babies. As scarlett was born in the early hours my partner and I where advised to go and get some rest. We spent the next day with Scarlett, feeding her through a tube and enjoying the occasion. My other children visited in the evening, meeting Scarlett for the first time. I suppose now would be a good time to mention that I have three children from a previous marraige, Alice who was then 16, Christopher 18 and Kirsty 21. Scarlett had completeley taken my partner, I and the rest of my family by surprise. I had spent the previous week in hospital as my waters had suspectedly broken. Under the assurance of the nurse in charge of Scarlett I decided to spend that evening at home. At 10.am the following morning Steve and I arrived at the hospital. We rang the buzzer on the intensive care unit. Usually the nurse would just press the release button from the reception desk and let us in but this time she came to the door. I could tell instinctively from her face that things where not right. She explained that Scarlett had been screaming all night and although she had been happy to feed at every opportunity she had so far not yet opened her bowels and her stomach was looking very distended. She suspected that Scarlett may have a twisted bowel. The facilities at Huddersfield Royal infirmary are limited and there are no surgical units for babies. If the diagnoses was right Scarlett needed surgery immediately. The problem was now finding a hospital out of our region with avaialble space. After trying three hospitals St Marys of Manchester agreed to accept Scarlett. She was transported in an ambulance by a team of medics. My partner and I where not allowed to travel with her so we made our own way there. On arrival we where introduced to the proffessional team, surgion, anaethestist and other equally important, but with less stature than the former. After checking Scarlett over We had a consultation with the surgion and he explained that the part of the bowel that was to be removed was slightly higher than he would have preffered (the higher the more difficullt it could be for Scarlett to absorbe nutrients), but we had no choice and hoped the operation would be succesful. She had 15cm of bowel removed and when she returned from the operating theatre she had as explained by the surgion stomas and a stoma bag (colostomy). During the initial consultation with the surgion Steve and I where told that it was normal procedure to insert a long line into the babies in the neonatal unit at St Marys Manchester. It allowed the team to feed the babies on a substance called TPN and also if in emergency it would be used to administer antibiotics. The theorybeing that the antibiotics given this way work very quickly. At the same time we where informed of the risks of infection. Catch 22 situation but forever the optimists we agreed. Scarlett was doing well, we where told that the operation had gone smoothly and after maybe four or five days Scarlett was taken off her ventilator and moved from the intensive care unit to the recouperating room next door. It was the first time for her out of the incubator apart fom the brief moments We got to cuddle her in intensive care when it took the nurse what seemed to be ages to sort out the spaghetti junction of wires. Both my partner and I where excited at not having to look at her and touch her through a plastic bubble. Parents where allowed to stay overnight at St Marys Manchester if their child was in a critical situation. My partner and I had stayed during the time of the surgery and when the staff where confident that Scarlett was progressing we would make the journey home in the evenings and return the following day. She had been in the recouperating room for aproximately one week. Steve and I where slightly more relaxed, although it was touch and go as to whether or not she was tolerating her food, loose stools, pale colour. We recieved a phone call at 3.am in the morning informing us that Scarlett had collapsed. The nurse who was looking after Scarlett that evening asked us to get to the hospital as soon as possible (this usually means that it is a life threatening situation). When we arrived Scarlett was back in the intensive care unit. After various tests it was found that Scarlett had a fungal infection in her longline. We where told that the implications could be fatal. It was the most feared infection of the longline. She was promptly administerd the correct antibiotics and we where told that she could be on them for a long time. The longline had to be removed because of the infection and another one inserted on the opposite side of her body. She was very ill. Scarlett is a very brave little girl, she made good progress with the infection and after approximately one week she was moved back into the recouperating room. At a very young age scarlett had already had every scan and every test known to humankind. It had been found previously that scarletts heart was not normal although so far it had been functioning adequately. Scarletts intolerance of food did not get any better. She failed to thrive and the experts decided that it was time to remove the stomas and rejion her bowel. At the initial consultation prior to the bowel operation Steve and I where educated with all the facts. We where told that if Scarlett was gaining weight and living a near to normal life the stomas could remain for as long as seven years. This was not the case for Scarlett. I can remember sitting next to Scarlett in the hospital the day the doctor decided it was time for the stomas to be rejoined. I felt that something was not right although her stats where telling a different story. She did not look well to me but I put my trust in the professionals and off she went once again to the operating theatre. My partner and I where waiting anxiously in one of the parents rooms for her return. Finally the nurse came and informed us that the operation had gone well and we could go and see her in a short while. She then returned after what seemed like hours and told us that Scarlett seemed to be having difficulty comming round from the anaesthetic. Then the doctor who had performed the operation came to our door, he looked very panicky. He suggested that Scarlett may have gone into heart failure. It was touch and go again. When we finally go to see her she was in a very pittifull state. She looked at me though the incubator and I actually could see fear in her eyes. The cardiologist was brought in on her evening off. She assessed Scarlett and gave the doctor a ticking off for doing the operation too soon after the fungal infection.She then prescribed Scarlett with yet another list of medications. Scarlett being Scarlett eventually recouperated enough. The rejoined stomas where a success. It was a revolution when she pood for the first time through her bottom and once again she was moved back into the recouperating room. Scarlett had been under the sunlamp in the early stages of her stay in Manchester because of jaundice but now it seemed that she was getting yellower every day. She had several tests done and the doctors said that her liver had enlarged and they had no idea why. They suspected that it could be a condition called bilea atresia. After having her liver scanned the doctors where still unsure of the cause of the jaundice and Scarlett was transported to the Liver unit at St James' hospital in Leeds. I have to say in my opinion that this was the most caring and proffessional hospital that any parent could wish for. After spending two weeks there it was suspected that Scarletts liver had not been able to cope with the TPN-it was too fatty for her liver to break down. She was prescribed even more medications and with the abscence of the TPN her liver started to improve. The doctors at Leeds did not suspect that it was bilea atresia although they could not be completely certain. As she was till finding it difficult to gain any weight St James' decided that Scarlett could return to Huddersfield Royal Infirmary for one week to concentrate on weight gain and then we could finally take her home. Steve and I where exited at the prospect of being allowed to take her in our car. It was the first time the three of us had been together independantly. I stayed with Scarlett for one week in HRI. She still did not gain weight. After persuading the staff that they could do no more than I could do at home, they learned me how to administer all the medications and how to insert the feeding tube should it come out. We where finally allowed to take her home. Another catch 22 situation,although excstatic I was also very frightened. Scarlett continues to frequent hospital visits with various consultants. It was found that one of Scarletts kidneys is much smaller than it should be. At Christmas 2006 I recieved a phone call from St James' after recent blood tests to tell me that her liver had returned to normal. What a Christmas present. Although things seemed to be on the up Scarlett caught (and still catches) every infection going, she was always on some antibiotic or other and still failing to gain weight. She would put on two ounces one week only to lose it the next but she was growing in length. I can remember thinking that she would end up like a piece of string. During Scarletts stay at St james' hospital i had had a consultation with a genetecist. She had asked permission to take photos of Scarlett and asked various questions on family members but nothing became of it. Since bringing Scarlett home we have had the good fortune of being under Dr Schwartz, paedeatrician at Huddersfield Royal Infirmary. She made an appointment for Scarlett to see another genetecist in he summer of 2007. 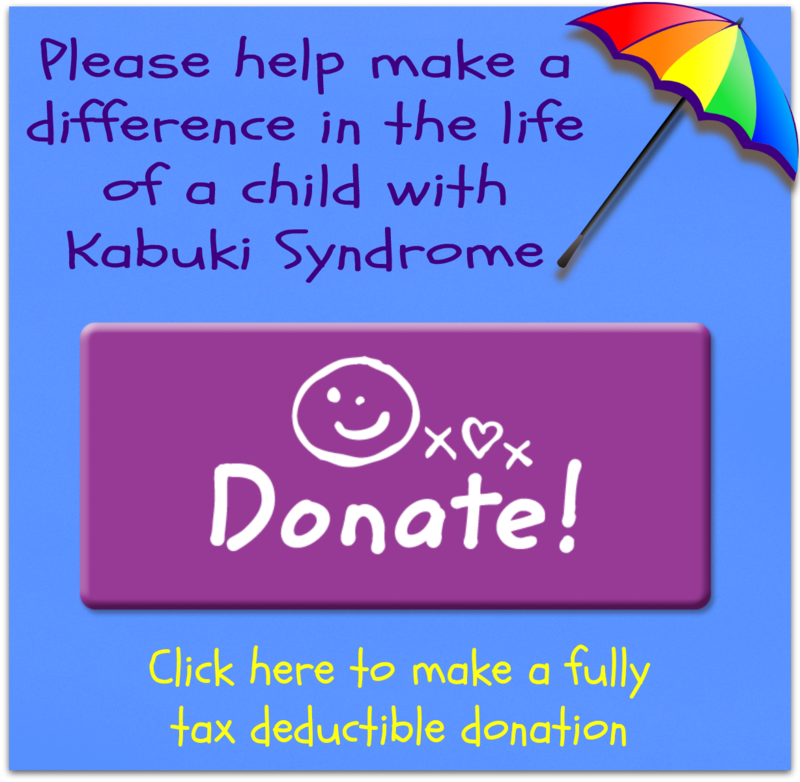 Scarlett was diagnosed with Kabuki syndrome shortly afterwards. I was told that the board was unanimous.